Julie Nutting's new book, Collage Couture , takes you through the fun process of sketching your own fashion figures and dressing them in collaged clothing. Wait, did I just hear you say that you can't draw people or faces? Not to worry! Julie takes you through the simple steps and proportions to create your very own croquis (undressed outline of a figure) in different poses. Tracing paper will become your new best friend as you create the figures and the fashions that are possible with Julie's simple techniques. Julie also gives you lots of tips for creating backgrounds that are appropriate for these fashionable residents. 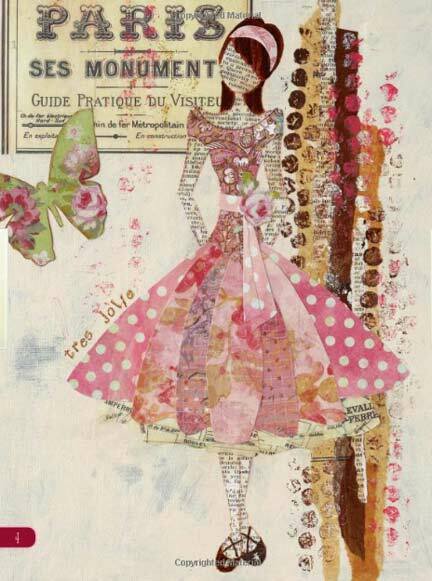 Most of her pieces are done on canvas boards, but some are framed, some are designed as paper dolls (both jointed and not), and some are shown on journal covers and other small gifts. I think you'll find this volume delightful, and if you were the kind of child who loved paper dolls, it will take you right back to an earlier time! This book is published by North Light Books, an imprint of F&W Media.